Click icon to access and download the data set used in the graphic above. Details on which countries of origin are responsible for the steepest declines in the fall of 2017 remain scant, but anecdotal reports point to one primary source: India. A handful of factors – including uncertainties about U.S. Immigration policy and work authorizations; concerns about personal safety in the face of a rising tide of nationalism in the U.S., and news about the shooting of an Indian national in Kansas; and the appeal of other education destinations closer to India – have, by all accounts, dramatically diminished Indian interest in U.S. institutions in the last year. In the face of these statistics, there’s new urgency around the need to identify new and smarter ways to recruit qualified, ambitious students. The most important strategy for doing so is diversification – a term that’s often understood as referring to identification of new regional or national markets. However, when it comes to India, the second leading sender of students to the U.S., Canada, and Australia, and an increasingly important source of international students for a number of other nations around the world, the smart play may not be to go elsewhere in the world, but to dig deeper within India itself. “Those who compete in India will need to push past national averages and seek deeper, more granular market insights at the level of states, cities, or metropolitan clusters,” McKinsey & Company analysts in wrote in 2016. The strategy applies not just to McKinsey’s traditional corporate audiences, but to higher education institutions as well. In the recent past, many schools have relied on a handful of Indian cities for the bulk of their recruiting efforts. Between 2008 and 2012, for instance, the vast majority of student visas were allocated to applicants from traditional recruitment hubs like Hyderabad, Mumbai, Chennai, Bangalore, and Kolkata. 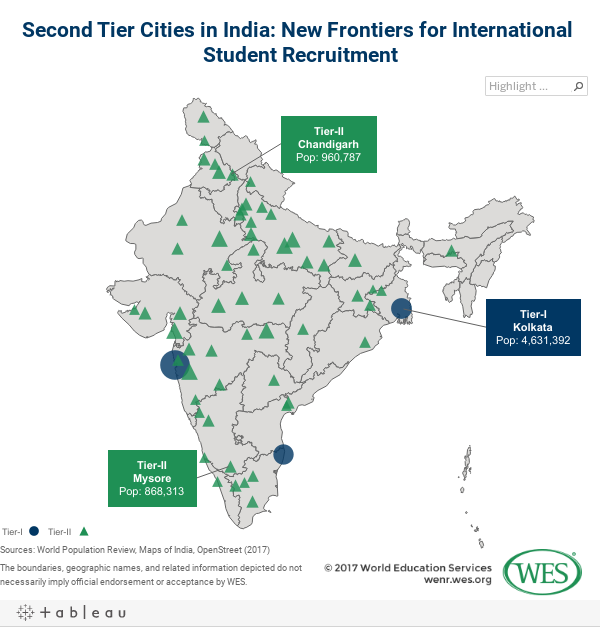 The challenge for many U.S.-based enrollment managers is that understanding what a Tier II or III city is in the heterogeneous Indian context. It’s a surprisingly complicated question. There is no standardized global definition of city tiers to guide enrollment managers in their efforts to reach new urban markets. The definitions that apply in China, for instance, have little to no meaning in India. That said, some parameters can be set. What those should be, exactly, remains something of an open question. India’s Ministry of Finance has one set of definitions that defines Tier I cities as “highly commercialized metropolises” with a population of 100,000 or above. These cities, which include Hyderabad, Mumbai, Chennai, and Delhi, receive the highest government spending and infrastructure development. Boston Consulting Group (BCG) categorizes Tier I cities as those with populations of one to four million; Tier II cities as 500,000 to 1 million; and Tier III and IV cities as 10,000 to 500,000. It calls cities with more than four million residents “metropolitan areas.” In 2015, BCG analysts argued that Tier II cities would, by 2025, “grow by 4.5X and account for ~45 percent of consumption…vs ~35 percent [in 2015].” These cities, they said, would also “add 30 percent of elite/affluent households” expected to enter India’s middle class in India during the same period. McKinsey & Company categorizes cities in yet another way. Per McKinsey, Tier I cities include three megacities with more than 20 million residents; they have an average population of 5 to 7 million. McKinsey’s sets the population average in Tier II cities at 1.9 million residents. Amid these various definitions, the most relevant for higher education enrollment managers is arguably BCG’s: It focuses on smaller and mid-sized cities with a growing middle class. These smaller cities are often state capitals, and are often home to growing industries, in particular high tech. This article examines three in three different parts of the country: Bhubaneswar, Chandigarh, and Mysore. Located in Eastern India, Bhubaneswar is the capital city of the state of Odisha. On the map, it lies between two major cities which have proven to be reliable senders of students to the U.S.: Hyderabad, which is situated about 650 miles to the southwest, and Kolkata, which sits less than 300 miles to the northeast. There are several reasons that Odisha’s has long flown under recruiters’ collective radar. Most significant may be the fact that the state in which it’s located, Odisha, is low income as ranked against India’s other 28 states and seven union territories. Bhubaneswar is, however booming – whether measured against the standards of Odisha or of other cities in India. The city has seen massive population growth in a relatively short time, expanding from 38,200 residents in 1961 to an estimated population of about 837,737 as of the most recent Indian census in 2011. (The greater municipal area was then estimated at 881,998. Other sources estimates the current population at 1.15 million as of 2017, and likely to reach 1.44 million by 2022.) It’s also notable that Bhubaneswar’s population is young: About one in five Bhubaneswar residents is between 15 and 24 years old. Moreover, the city is well equipped to handle visitors – the municipal corporation estimates that it attracts an estimated 1.7 billion tourists a year. Companies with Bhubaneswar campuses include IBM, Infosys, Tata Consultancy, and Wipro. Bhubaneswar was one of the first to be named as part of a USD $1.2 billion Indian government program, the 100 “smart cities mission,” which seeks, as one of several urban development goals, to help cities foster and integrate high-tech. The city has been named by the World Bank as one of the top three cities for doing business in India. It has a dynamic higher education landscape. In fact, according to one 2015 paper, Bhubaneswar is a “major centre for education, with … numerous universities, engineering colleges and management colleges … in and an around the city. Today, other than the Utkal University and [Odisha University of Agricultural Technology (OUAT)], the city hosts a number of universities like the Utkal University of Culture, the [Indian Institute of Technology] IIT Bhubaneswar, NISER Bhubaneswar, KIIT University, SOA University, Xavier University Odisha. The city also has a very large number of engineering and management colleges which have sprung up in the last decade and attract students from all over the country as well as the state.” Other prominent HEIs include the National Institute of Science Education and Research (NISER), and the Institute of Life Sciences (ILS) are among the most prominent federal government-run HEIs. The Bhubaneswar Municipal Corporation seeks to transform the city’s energy grid to solar power, and released a master plan to govern the process in 2018. Together these factors imply that the city will have an ongoing need for highly skilled labor, including STEM graduates. Given the well-documented drive among outbound Indian students to enroll in U.S. institutions as part of a path toward employability, Bhubaneswar is an optimal recruiting environment, especially for institutions seeking to attract STEM students at the post-graduate level. Chandigarh is in Northern India. It is unique among Indian cities. Designed by Swiss architect and urban planner Le Corbusier and founded in 1966, the city is roughly 150 miles from the national capital, New Delhi. It serves as the capital of two states, Haryana and Punjab. It is part of a tri-regional metropolitan cluster, which also includes two satellite towns, Mohali and Panchkula. With an estimated population of between 960,787 and about 1.2 million, Chandigarh is on the brink of emerging into BCG’s first tier. Chandigarh has a burgeoning youth population, and is highly affluent – in 2015-16, it had the second highest per capita income in India. The city government has prioritized the development of English language skills at the secondary level, and established the Regional Institute of English (RIE) (formerly (the Punjab Institute of English) at the time of the city’s founding, in order to ensure teachers had the proficiency required to teach a second language effectively. The government is also seeking to establish an “education city” and has set aside 130 care centres for doing so. The goal is to align curricula at local higher education institutions with the future needs of the region. Urban growth and Chandigarh’s history as a planned urban community have created strong demand for trained architects and urban planners to help manage ongoing growth while maintain the city’s character. Other growing industries include hospitality, banking, and real estate. Chandigarh is home to a growing IT sector, a number of higher education institutions, and a fashion industry of growing repute. In 2016, an estimated 18,000 tertiary-level students in Chandigarh were seeking degrees in subjects ranging from social science, commerce, computer applications and science streams. Many attend three universities: the well-established, internationally ranked Punjab University, the PEC University of Technology, or Chandigarh University. Other notable institutions include the Indian School of Business (ISB), Mohali, Indian Institute of Science Education and Research (IISER), Institute of Nano Science and Technology (INST), and Chandigarh College of Architecture (CCA). Chandigarh has long been a hub for outbound mobility among Indian students, although not necessarily to the United States. As one New Zealand paper recently noted “Walking along the streets of Chandigarh in North India, the number of signs and banners advertising education abroad is staggering. They line the shop fronts with promises of “easy visas”, “instant approval”, and “residency,” vying for the attention of potential students.” The Canadian Education Centre Network has implemented agent training workshops in Chandigarh, as part of an effort to market Canada as a study destination to students from the Punjab and Haryana region. In 2014, British Columbia’s government funded 20 scholarships to support exchanges between a B.C. institution and Chandigarh’s Sanatan Dharma College. U.S. institutions have more recently begun to try and recruit more aggressively in Chandigarh. In 2015, the University of Riverside California announced the launch of a professional studies office in Chandigarh. The recruitment market in Chandigarh is more mature than in some Tier II cities, but it is one that merits a deeper look from U.S. institutions seeking to recruit for STEM programs, business, and design programs alike. Its suitability is likely to grow even more, as white-collar families employed by the IT industry look for opportunities beyond those available in India itself to educate their children. With over 100 large- and medium-scale industries and more than 25,000 small-scale industries, Mysore is positioned to witness a “small-scale industrial boom,” and is expected to attract several new engineering clusters that will drive employment among highly trained business and IT professionals. Mysore is also home to some of India’s top-ranked higher education institutions. The University of Mysore, and the JSS University of Mysore are among the 100 best institutions in India’s National Institutional Ranking Framework. The former attracts a substantial number of international students to its campus, making it something of a rarity among Indian higher education institutions. This system was used by India’s Ministry of Finance to allot what is called the Housing Rent Allowance (HRA) and Compensatory City Allowance (CCA) to the employees of the public sector posted in different cities across the country. However, following the recommendations of the sixth central pay commission of 2008, the population of the city is used as a criterion for division. The variability in population counts arises on account of bias in the sampling techniques adopted by various agenciesa, population selection methods differences (urban or rural, or both), and lastly, because of the age segmentation and counting methods – for instance, including population 3 years and above, including numbers for people holding a valid birth certificate of an infant or a newly born Etc.